Will their second chance at love end up just the latest in a string of disasters? Ten years ago, Angie left the coastal town of Easton, Rhode Island, for calmer waters. She didn’t find them. Now a failed marriage, a stint in rehab, and a baby belly are all she has to show for her time away. The last thing she needs as she speeds back into Easton is Nick Forest welcoming her in his police cruiser. Nick grew up fast when he discovered he’d become a father as a teenager. He’s created a responsible life but he hasn’t had a second chance at love since Angie left town. He’s sure he doesn’t need it until a routine stop has him falling for her all over again. Angie’s baggage is more than most men could handle, but Nick is intent on finding his way back into Angie’s heart. Her trust is harder to gain, and it will take more than just a walk down memory lane for Angie to finally come home. Warning: Caution, small town ahead. Where nosy friends stay loyal, family always interferes and a gorgeous man in uniform is more than willing to protect and serve the girl of his dreams. 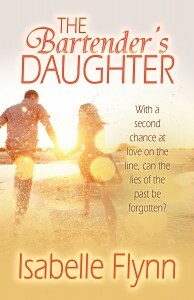 The Bartender’s Daughter is now available for sale. When Sam’s father dies, she inherits more than a broken down, small town bar. A second chance at love is on the line, but only if Sam can get past the lies and deception she left behind two years ago. Big city transplant, Sam Pierce, returned home to Oldport, Rhode Island, for a brief visit after her father’s death. Unexpectedly inheriting half of his bar has her confronting the past and the mistakes she left behind when she ran away two years ago. Lee Stone, former rich boy, has transformed himself into a successful business owner. His latest acquisition is more than just another business to add to his portfolio. A chance at redemption and a final reckoning with his estranged wife is on the line. All he has to do is convince Sam that there’s more to him than the weight of his wallet or the lies in their past. Welcome! I’m Isabelle Flynn and I write contemporary romance. I write stories about people falling in love despite the obstacles life creates. From a small town myself, I love exploring all of the intricacies of living where everybody knows your name…and your parents, your grandparents, your sister, your ex-boyfriend, your homeroom teacher from tenth grade…etc. Of course, I also grew up on the coast of New England and there’s something about living on the ocean that adds a little magic to everyday life. Add a small town to a coastal life and you have my debut novel, The Bartender’s Daughter, coming in November 2013 from Turquoise Morning Press.